Elizabeth Waldhauer is my paternal 3rd great grandmother. Born on August 25, 1792, in Effingham County, Georgia, to John Casper Waldhauer and Mary Floerl, she was one of ten children. The siblings I have listed for her are John C. (1785-? ), Charles (About 1792-? ), Mary Catherine (1794-1874), William (1797-1837), Susanna (1799-1823), Israel F. (1801-1874), Salome (1804-? ), Margaret (1805-? ), Tabitha (1807-1817). The Waldhauer and Floerl families were Protestant Salzburgers from modern day Austria who came to Savannah, Georgia, beginning in the 1730s because of religious persecution in their country. Elizabeth's grandfather Jacob Casper Waldhauer fought for his adopted country during the American Revolution. By the time Elizabeth was born, the war had been over for about ten years. Elizabeth probably grew up in New Ebenezer, the Salzburger settlement in Effingham County. When she was 17, she married Christian Herman Dasher, of another early Salzburger family, in Chatham County, Georgia, on March 30, 1809. Elizabeth gave birth to at least eight children: Sarah Ann (1814-1888), Margaret Amanda (1822-1880), Susan Catherine (1824-1901, my paternal 2nd great grandmother), Savannah Catherine (1825-? ), William H. (1827-? ), Ann Elizabeth (1829-? ), Georgia Ann (1833-1880), and Mary Gertrude (1835-1894). I'm not sure all of the information I have is correct. Savannah isn't mentioned in Christian's will. The 1820 Effingham County federal census has one son under the age of 10 and one daughter under the age of ten. The daughter may be Sarah Ann, but I don't know who the son could be. I found a note in my dad's papers that says Elizabeth and Christian had six sons who died young or in infancy. After Lowndes County, Georgia, was formed from Irwin County in 1825, this area became well known for its prosperity and drew the Dashers and Waldhauers here, as well as other Salzburger families whose names are still in this area. Elizabeth and Christian moved to Lowndes County sometime in the early 1830s. Christian is noted in History of Lowndes County Georgia 1825-1941* as one of the planters living near the county seat of Troupeville during that time, and Elizabeth's brother Israel was also listed among these planters. Her brother John moved to Lowndes at some point. 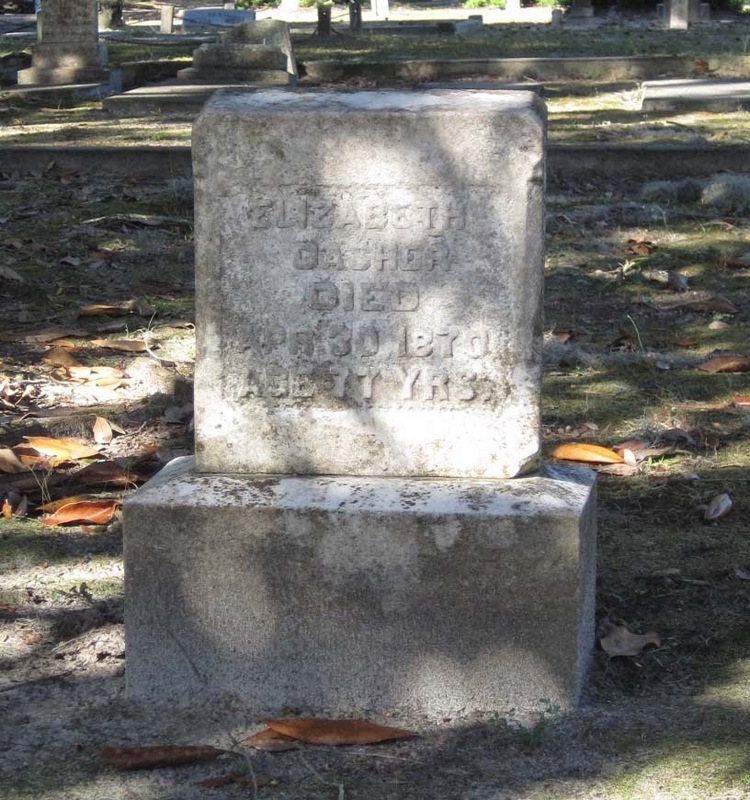 He's buried next to Israel and both are in the same plot as Elizabeth and Christian in Sunset Hill Cemetery in Valdosta. The Dasher-Waldhauer lot in Sunset Hill Cemetery in Valdosta, Georgia. From the left: John C. Waldhauer, Israel Waldhauer, Christian Dasher, and Elizabeth (Waldhauer) Dasher. It seems that Elizabeth and Christian were very involved with their church. According to History of Lowndes County Georgia 1825-1941*, Christian was one of four men who met each Sunday at their homes to study the Bible and the Apostolic Church. After their neighbors began to meet with them, they met at a school to have more room. After a few years, they outgrew this school and built another church. This early church was the forerunner of Valdosta's First Christian Church, the church my dad grew up in. Elizabeth and Christian's children married into the Wisenbaker, Parramore (my line), Warren, Remington, Smith, and Paine families of Lowndes County. Elizabeth and Christain lived in Lowndes County for over three decades before Christian died on February 20, 1866. Elizabeth died four years later on April 30, 1870. Elizabeth Waldhauer's headstone in Sunset Hill Cemetery, Valdosta, Georgia. It says, "Elizabeth Dasher Died Apr. 30, 1870, Age 77 Yrs." Christian Dasher's headstone in Sunset Hill Cemetery, Valdosta, Georgia. 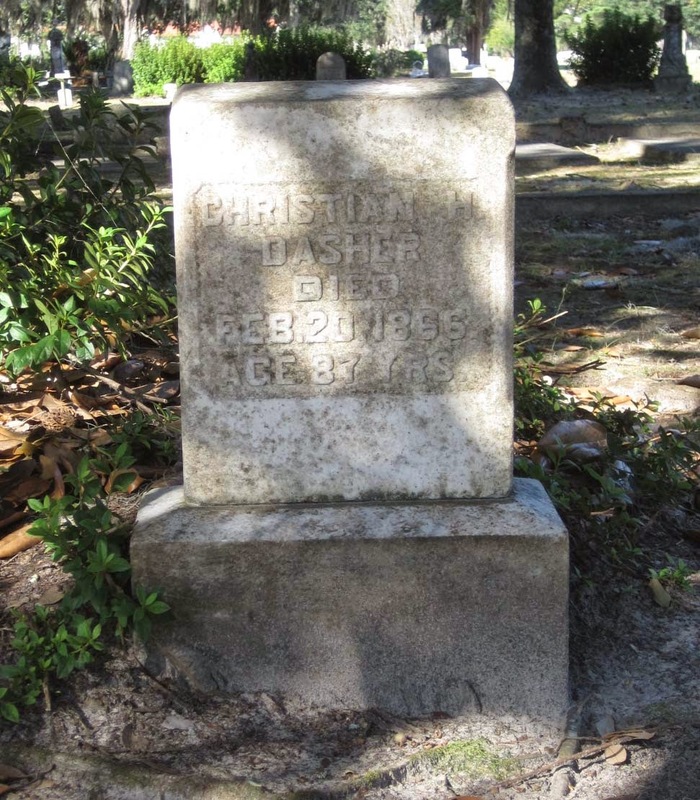 It says, "Christian Dasher, Died Feb. 20, 1866, Age 87 Yrs." * General James Jackson Chapter, NSDAR, History of Lowndes County, Georgia 1825-1941 (1942; Reprint, General James Jackson Chapter, NSDAR, 1995), 6, 107.